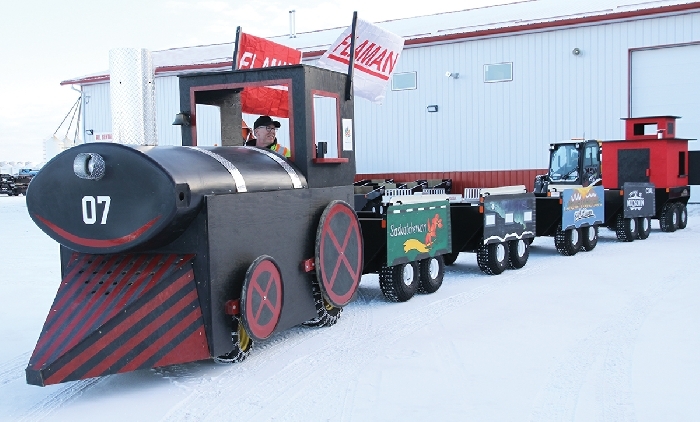 The Flaman staff in Moosomin have created this train, which will be providing rides around downtown Moosomin this evening for Moonlight Madness. Moosomin’s Moonlight Madness is Tonight, Wednesday, November 29. Stores will be open until 9 pm that night and many stores will be holding Moonlight Madness sales. The Chamber will be distributing Moonlight Madness cash cards to all businesses that will be open for Moonlight Madness. Shoppers can ask for a card at the first business they shop at that night. Each card can be stamped at five businesses between 5 pm and 9 pm Wednesday and left at the last business a person shops at. They will then be entered into three draws for Moosomin Bucks—one for $500, one for $250 and one for $100. Borderland Co-op plans to have their mascot, Cooper, out that night, with a sack full of coupons for discounts and giveaways at local businesses. “In the past Cooper has gone out from 5-8 pm and businesses have given coupons that can have anything on them—freebies, discounts, whatever you think to get people to come into your business,” Tera Harper of Borderland Co-op said. Harper said businesses wanting to include coupons in the bag can contact her. For the second year, the Flaman Christmas Train will be making the rounds in downtown Moosomin, giving the kids a ride during Moonlight Madness. Two years ago, Flaman Manager Mark Steininger and his staff built a wagon to take Santa Claus through downtown Moosomin. People asked if their kids could ride with Santa, so the next year Flaman built a Christmas Train pulled by an ATV. This year Flaman has improved on the idea—a train engine and caboose have been added to the Christmas Train. The train station will be set up at the Borderland Co-op Marketplace parking lot. Flaman will be collecting donations for Caring Communities at the Christmas Train. Donations of non-perishable food, toiletry items and unwrapped toys will be accepted for Caring Communities and Flaman is hoping to fill the caboose. Steininger says the Christmas train was popular last year. He said running the Christmas Train is a lot of fun. “It’s a lot of fun for us,” he said. “Last year 100 per cent of the people who work here were down there. Everyone who works here was down there, most of their spouses were down there, and some of their kids. Borderland Co-op will be serving hot chocolate and goodies inside the store. Five local roller derby girls have made Team Canada in Roller Derby, and will be set up to wrap gifts and collect donations at Witch’s Brew Wednesday night in return for a donation. They are raising money to help cover the costs of Team Canada practices in various Canadian locations and to travel to the Junior Roller Derby Association 2018 World Cup in the U.S. next July.